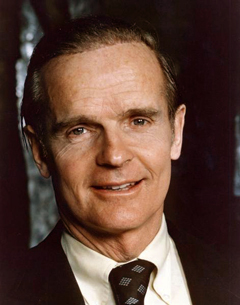 The Wisconsin Historical Society holds the papers of Senator William Proxmire (1915-2005). Proxmire served for 32 years in the U.S. Senate (1957-1989), battling to protect human rights and to curb federal waste and corruption. The Senator William Proxmire Collections primarily document the senator's political career 1945-1989. The unpublished papers, totaling over 200 boxes, include office files, correspondence, audio and videotapes, articles, press releases, books, and images. There is little about his early life or retirement years. A complete box-by-box inventory is available for viewing online. Related Proxmire documents reside in 30 other manuscript collections at the Society. The most important are 40 oral history interviews with some of the senator's closest friends, colleagues, and family conducted 2008-2011. The Society has digitized more than 7,500 pages of manuscripts, press releases, newsletters, photographs, articles, interviews, books and correspondence selected from the Proxmire papers and all 40 oral history interviews. It is the richest online resource about Sen. William Proxmire's life and times. Digitization of these materials has been made available through the generous support of Sen. Proxmire's family and friends. How are the Senator William Proxmire Collections Organized? More than 7,500 pages have been digitized from the collections and are grouped by subject. See office files, correspondence, audio tapes, newspaper articles, press releases, books and images. Sen. Proxmire's unpublished papers fill more than 200 boxes in the Archives at the Wisconsin Historical Society. Thorough researchers will want to consult these manuscripts. Most manuscripts date 1957-1980, though some are from as early as 1938 or as late as 2004. They consist primarily of biographical materials and clippings, constituent correspondence, speeches, books and articles, sound and video recordings, newsletters and press releases, and federal agency case files. The heart of the Proxmire papers collection are the files of his office staff. They document a multitude of legislative issues important to the Senator: banking regulation and reform; the Federal Communications Commission's Fairness Doctrine; ratification of the international Genocide Treaty; Great Lakes harbors and shipping; Wisconsin agriculture; and the Supersonic Transport plane (SST), the B-1 bomber, and other military spending. General subject files document topics such as abortion, economic development in Wisconsin, opposition to the Senate leadership of Lyndon Baines Johnson, taxes, and energy. They also contain campaign files, Golden Fleece Awards, schedules, voting records, filmed campaign ads, and televised "Reports from Washington." Files of earlier years in his career include papers from Proxmire's three unsuccessful gubernatorial campaigns during the 1950s, his tenure as a one-term Wisconsin assembly member, and recordings from his "Union Labor News" radio program. Photographs in the Proxmire papers collection include publicity shots with constituents or prominent political leaders, as well as from parades, regular workdays, and the Wisconsin State Fair. The collection also contains a number of portraits. Many published books, pamphlets and journals from the Senator William Proxmire Collections are available for check out from the Society's Library. Check the University of Wisconsin-Madison Library Catalog for availability. Unpublished materials in the Archives do not circulate. However, some materials can be sent to any of our 14 Area Research Centers around the state for viewing. Reproductions of any image in the collection are available for purchase. For more information about licensing commercial uses or purchasing reproductions, click "Buy a Copy" beneath most images or contact us. Photocopies of materials in the physical collections are available for a fee. Bibliographic data can be found below any online document in the collections. Copy and paste the bibliographic data into your preferred citation manager. The Society offers you the Senator William Proxmire Collections with the permission of his heirs. These materials may be used for non-profit educational use or personal research. Reproduction of a portion of a work for those purposes has generally been accepted by the courts as fair use under the U.S. Copyright Law. The Wisconsin Historical Society does not own the copyright and can neither grant nor deny permission for further reproduction of these materials. You, the user, are legally liable for complying with the provisions of that law. For more information, consult the U.S. Copyright Office publications. Any documents in this collection created by U.S. government employees as part of their official duties are not copyright protected. Haney, Richard. "The Rise of Wisconsin's New Democrats: A Political Realignment in the Mid-Twentieth Century." Wisconsin Magazine of History: Volume 58, number 2, (winter, 1974-1975). Read the biography on Senator William Proxmire (1915-2005).